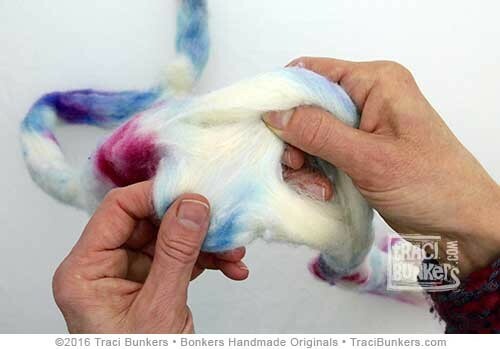 Don’t be sad when you see lovely hand-dyed spinning fiber but you don’t know how to spin! 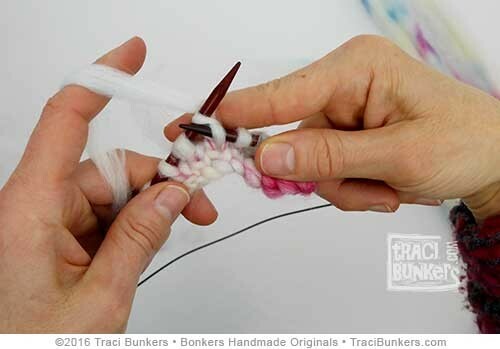 Here’s a tutorial to get you started with how you can knit (or crochet) with it just like yarn, without having to spin it. To be super helpful, I’ve made a video AND taken step-by-step photos showing you how to do it. I recommend both watching the video and reading through the tutorial to be sure you get all the important details. This isn’t hard, but it does take a little practice. 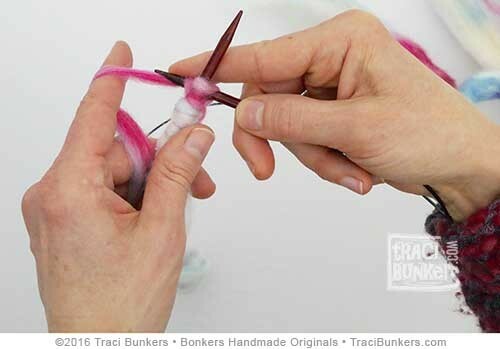 With this method, you only have two “ends” to weave in: at the beginning of the project, and the very end! Just like when working with yarn, it’s a good idea to make a swatch first, not only to check out how the stitch pattern will look, but also to figure out your gauge, especially if it’s something that needs to fit a body part. 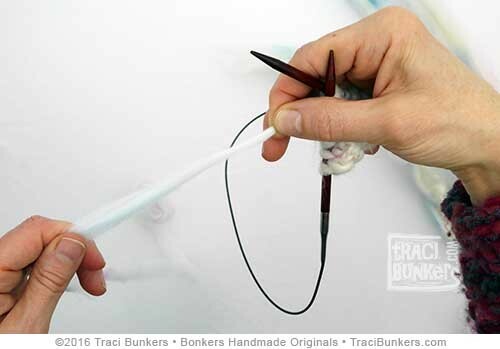 Although I’m demonstrating this technique with knitting, it is the same process for crocheting. Here’s my video. If you have trouble viewing it, click here. 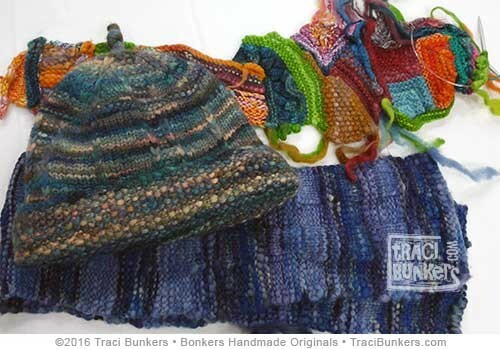 Here are some projects that I’ve made with unspun roving, The hat is finished, and both scarves are in progress. Look how luscious the freeform scarf is! 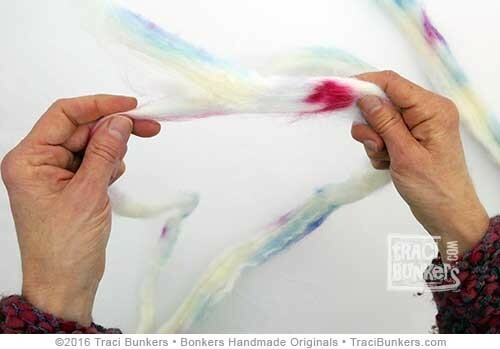 It’s not completely made out of unspun roving–it has a little commercial yarn in it for accent, along with unspun silk, and some mohair locks. 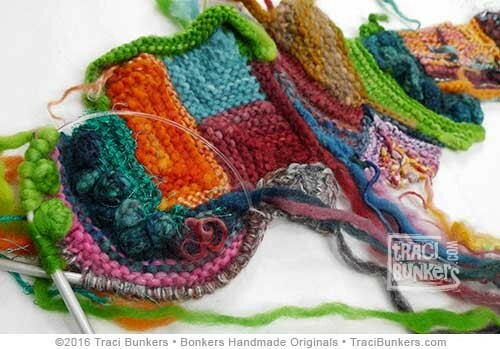 This is a good example of how you can combine this technique in a project with other fibers and yarns. 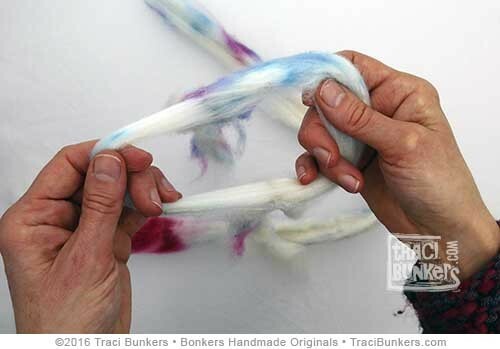 To get started, first choose a roving that is at least 50% wool or merino so that it will hold together. Also, the length of the fibers that make up the roving need to be long enough to be used in several stitches, or it won’t be very durable. My favorites are merino, or merino blended with silk, rayon, bamboo, or mohair. 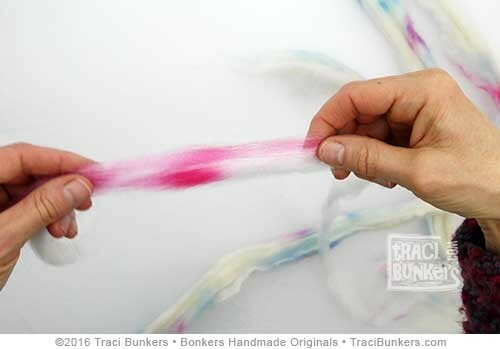 Avoid superwash fibers (machine washable) because they are too slippery and won’t hold together. 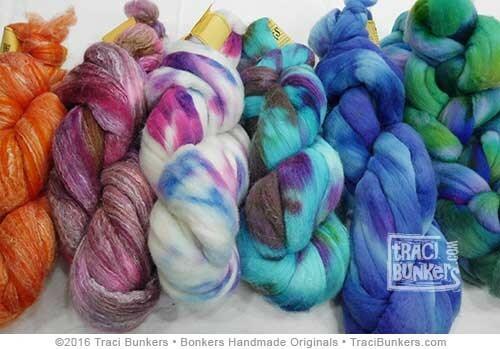 Here are some of my hand-dyed fibers that work well for this. 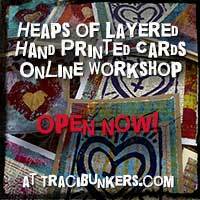 You can find them here in my shop. Measure off about an arm’s length and pull the fiber apart. Longer than that will be harder to work with. Never cut it! That will cause short fibers where you cut, making the “yarn” weaker in that area and the finished project will pill. If you have trouble pulling it apart, tease it open first in the area where you want to break it. 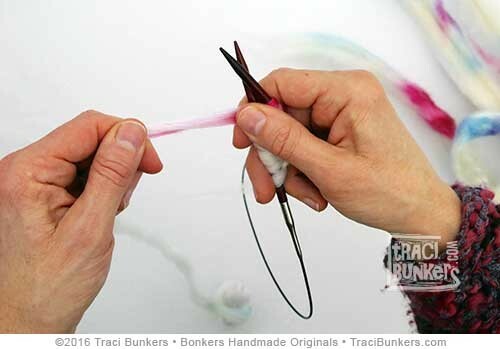 Then try again, making sure your hands aren’t too close together and that the roving isn’t twisted. 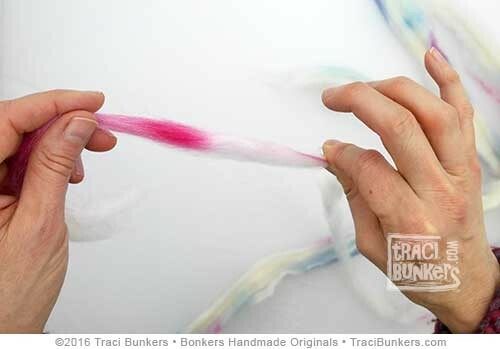 After breaking off an arm’s length, put your fingers through the middle and strip it in half lengthwise, all the way to each end, making 2 thinner pieces. This helps open up the compressed fibers. From one of those halves, strip off a length that’s a little thicker than the weight of yarn you want to knit with. If the piece is too thick, strip it again. It’s better to tear off a strip that’s a little too thick than too thin because you can draft it to the right thickness. If it’s too thin, you can still use it, but you’ll need to hold it with another strip and draft them together to the right thickness. Next, draft the strip to the desired thickness by pinching with one hand and slowly pulling with the other. Work from one end of the strip to the other end. 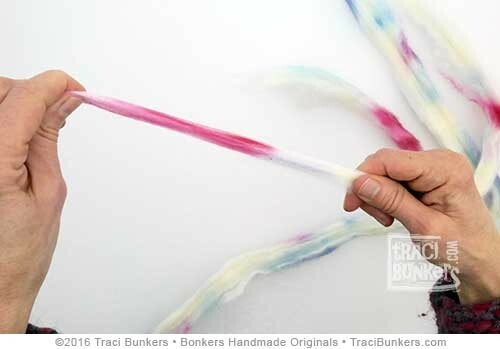 Be sure your hands are farther apart than the length of the individual fibers, or you won’t be able to draft them apart. Don’t worry too much about having inconsistent areas. The irregularities add to the charm. You can also draft it more as you knit. If you get a spot that’s too thin, pull it apart at the thin area. Then overlap the ends about 3-6″. 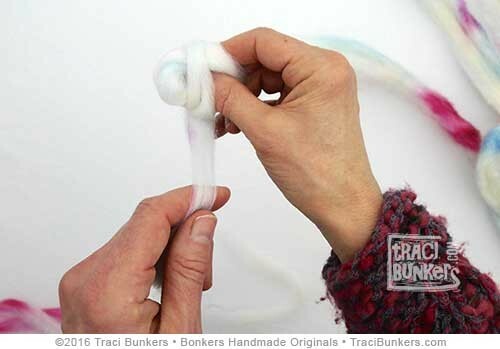 Also do this if you accidentally pull the strip apart, or when you are ready to join a new strip while knitting. Use what I call the “finger lickin’ trick” to help hold the fiber together where you’ve overlapped it: lick your index finger (or touch it to a damp sponge), then roll the overlapped areas between your fingers in a few spots. You don’t have to lick your finger, but it helps hold the fiber together better. Then if needed, draft the area to the right thickness. When the strip is about the weight you want to knit with, loosely roll it into a ball. When you first start out, only prepare one or two strips at a time. That way if you decide that you need thicker strips once you start knitting, you haven’t already stripped everything too thin. But if that does happen, hold two pieces together and draft them together into one. You are ready to cast on and start knitting. At first it can be tricky to see the stitches, so be careful not to insert the needle into the fiber instead of the stitch. But after the first row, it’s easy to tell them apart. While knitting, pinch and draft as needed when you come to a thick spot. When ready for a new strip of fiber, overlap the pieces like before and roll the overlapped areas between your (licked) fingers in a few spots. Then draft and keep on knitting! When you’re done, weave in the ends like you would if you had knitted with yarn. Remember that your item will need to be hand washed, unless you want to felt it. That’s all there is to it! 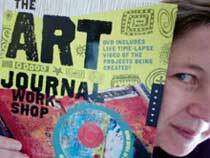 Practice a little first before jumping into a big project. And keep in mind that the better shape that the roving is in to begin with, the easier this will be. Using roving that is slightly felted or messy, will be harder to strip down and draft. 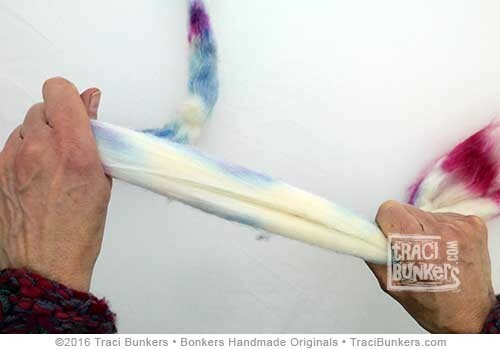 If you haven’t already, be sure to check out my hand-dyed spinning fibers to use for your projects. And, after you’ve tried this, I want to see what you’ve made. Send me some pictures and I’ll post them! 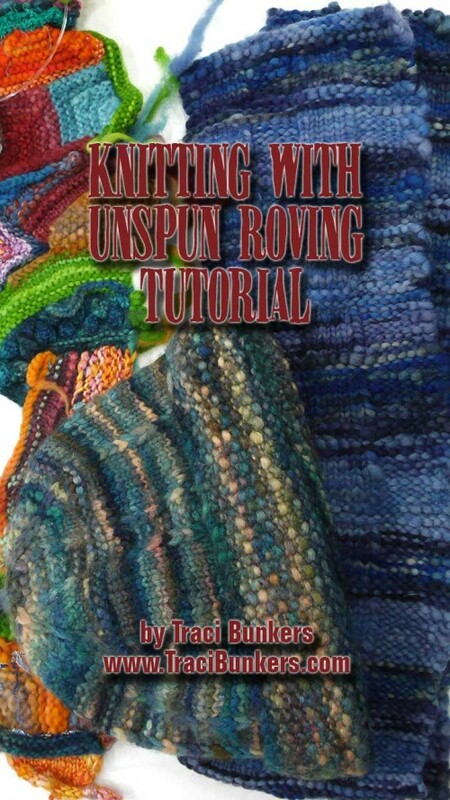 Posted in tutorial and tagged crocheting, fiber, fiber art, hand-dyed spinning fiber, knitting, roving, tutorial, unspun roving.